1159. Chen Jie & Gong Ying. 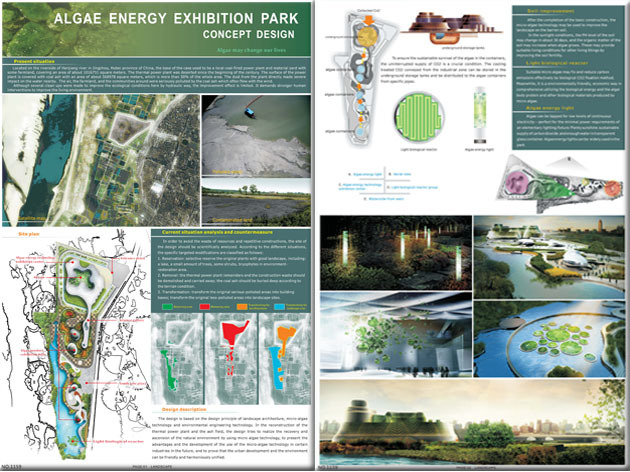 Algae Energy Exhibition Park, Jingzhou, Hubei, China. The site along the Hanjiang river was a coal-fired power plant, with coal ash covering 50% of the whole area, severely impacting air, land and water quality. The design of the algae energy park is to provide the public a comfortable park and popularize alternative energy technology. For more information about this entry, contact the author. email: 56988798@qq.com. for home, community and urban gardens, rooftop, mobile and vertical farms and living buildings. Visionary Algae Architecture and Landscape Designs from the Algae Competition. Robert Henrikson and Mark Edwards.